Fortune Teller is easy to play and you definitely won't need some sort of user manual. It has five reels, three rows, and 15 pay lines, making it easy for you to keep track of what is going on on your reels. Because of this simple layout, it's a bit of a shame that this slot uses so many standard symbols. Namely, the standard symbols do not add anything to do game, as a clear overview has already been established. The animations that have to do with the overall theme, however, don't look sharp and crisp. Fair enough, Fortune Teller is already a somewhat older slot. Make sure to pay attention to the glass ball as this symbol functions as the wild. This wild symbol can substitute for any other symbol except the free spins symbol and bonus symbol. These two symbols lead to, respectively, free spins and the bonus game. Every software developer has at least one slot that revolves around a fortune teller, and so does Amaya. 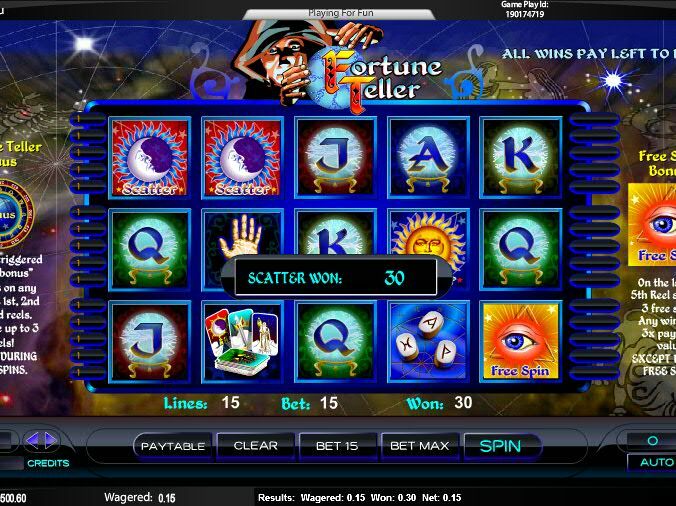 Fortune Teller is an above-average slot, even though it would have been nice if the animations were somewhat sharper. The layout of the slot is standard and you will encounter quite some standard symbols. However, you will mainly focus on the bonus game and free spins in this game. Fortune Teller is easy to play and you definitely won’t need some sort of user manual. It has five reels, three rows, and 15 pay lines, making it easy for you to keep track of what is going on on your reels. Because of this simple layout, it’s a bit of a shame that this slot uses so many standard symbols. Namely, the standard symbols do not add anything to do game, as a clear overview has already been established. The animations that have to do with the overall theme, however, don’t look sharp and crisp. Fair enough, Fortune Teller is already a somewhat older slot. Make sure to pay attention to the glass ball as this symbol functions as the wild. This wild symbol can substitute for any other symbol except the free spins symbol and bonus symbol. These two symbols lead to, respectively, free spins and the bonus game. Fortune Teller has a fun, multi-level bonus game, even though graphically, it isn’t a great success. When the bonus symbol lands on your reels at least three times, you enter the bonus game. In the bonus game, you play with concentric circles and four arrows, all pointing in a different direction. First, you play the inner circle, where you will come across quite a few wins, and the sun. The sun is your target. When you manage to reach the sun, you will receive a monetary reward you and access to the next round. During this next round, you play on the second inner circle, where you can win even more. In total, you get to choose twice, so you will be able to win handsomely during the bonus game. 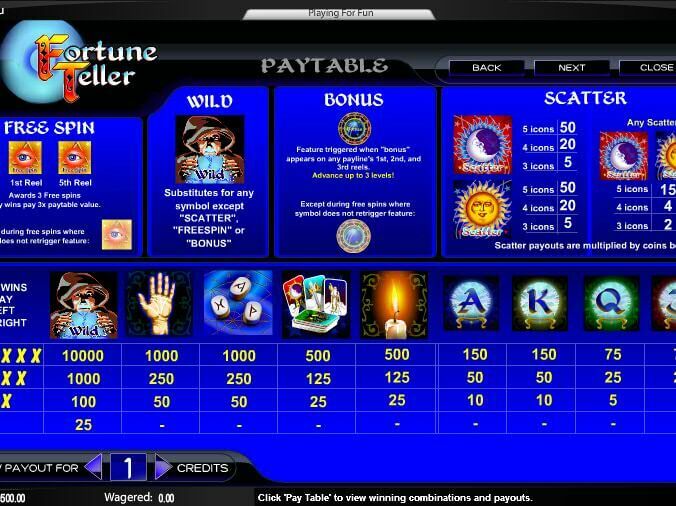 Fortune Teller is also equipped with free spins. In order to reach free spins, you won’t need the scatter, as the scatter just pays out money, no matter its position on the playing grid. In fact, you need another symbol to reach free spins. You can find this symbol on the right-hand side of the playing grid. If this symbol lands on the first and fifth reel, you will receive three free spins during which all wins will be multiplied by three. Free spins are spun on the same reels as regular spins, but there is one difference. Namely, you cannot win free spins during free spins. Fortune Teller has a total of 15 pay lines and you cannot determine how many of them will be active: all of them will. You can, of course, still alter your total wager. You can do this in the bottom left corner of the slot or by clicking on the Bet 15 button. Pressing this button also is the very first thing you will have to do before the wheels start spinning. The slot does have an autoplay function, but Amaya hasn’t made it a good autoplay function as it is rather bothersome to configure the number of automated spins you want. And after a bonus game, you have to do it all over again. Therefore, it’s even less work to not use the autoplay function!